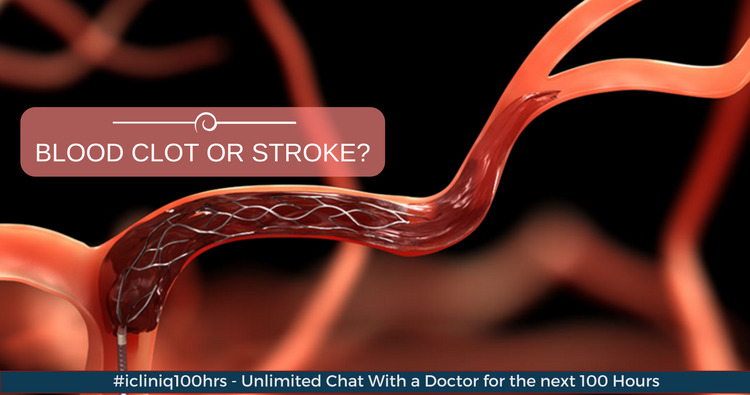 Will high platelet count cause a blood clot or stroke? iCliniq › Ask a doctor online › Answers › Hematology › High Platelet Count › Will high platelet count cause a blood clot or stroke? Q. Will high platelet count cause a blood clot or stroke? My mother has high WBC count of 15,000, platelet count of 5,40,000, and hemoglobin at 11.2. Her ESR is 86, and CRP is also similar. She has a fever, which rises in the evening to 101. Can you please tell me what this denotes? Also, will the high platelet count cause a danger for a blood clot or stroke? Currently, she is taking Mesacol 800 mg, VSL#3, Amodep-AT for blood pressure, and Thyronorm for thyroid. • Can high lipoprotein and hs-CRP cause cardiac problems? • Bladder biopsy shows eosinophilic cystitis with eosinophil infiltration. Please help. • What does high hs-CRP indicate? High platelet count will not lead to thrombosis in the body. Do not worry about that. High platelet is because of reactive thrombocytosis, and that can occur in bleeding, anemia, infection, inflammation, etc. You have an ulcer in the colon, and it seems to be ulcerative colitis, for which, you have been prescribed Mesacol (Mesalamine). So, biopsy has to be taken from ulcer to rule out the exact cause. This inflammatory bowel disease is leading to high ESR (erythrocyte sedimentation rate), CRP (C-reactive protein), and high leukocyte count in your case. Specific treatment should be given as per the cause. Also, investigate with a stool culture. Take treatment only after consulting a gastroenterologist. Hope this will help you. Take care. The medicines were prescribed by a gastroenterologist only. What does one investigate with stool culture? Could you kindly elaborate the sentence 'biopsy should be taken from the ulcer to rule out the exact cause'? Thanks again. It is good that you have consulted a gastroenterologist for your condition. The drug Mesacol is used in ulcerative colitis. Ulcerative colitis is idiopathic inflammatory bowel disease, and biopsy is beneficial for that. There are many causes for ulcerative colon lesion. I suggest you undergo biopsy, were only 0.5 to 1 cm tissue is removed during colonoscopy. This tissue is sent for histopathology examination. So, by histopathological examination, any inflammation, infection, ulcerative colitis, or malignancy, can be ruled out. Here, the chances of malignancy are very nil, so do not worry. By stool culture, the specific organism can be identified causing diarrhea, and accordingly medication for that can be suggested as per the culture report. Take care. Hope your concern is solved. You can discuss all this with your gastroenterologist, and then let your gastroenterologist decide whether a biopsy is needed or not. Does biopsy on a pregnant woman result in any complication? MRI shows stroke and brain changes. Is it due to untreated sleep apnea?